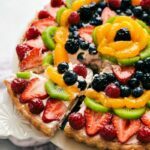 A twist on the famous “Fruit Pizzas” — this one made in a tart pan with a sugar cookie crust and a delicious + light no-bake “cheesecake” filling. I know, I know. A fruit pizza isn’t anything original and there are dozens all over the internet. 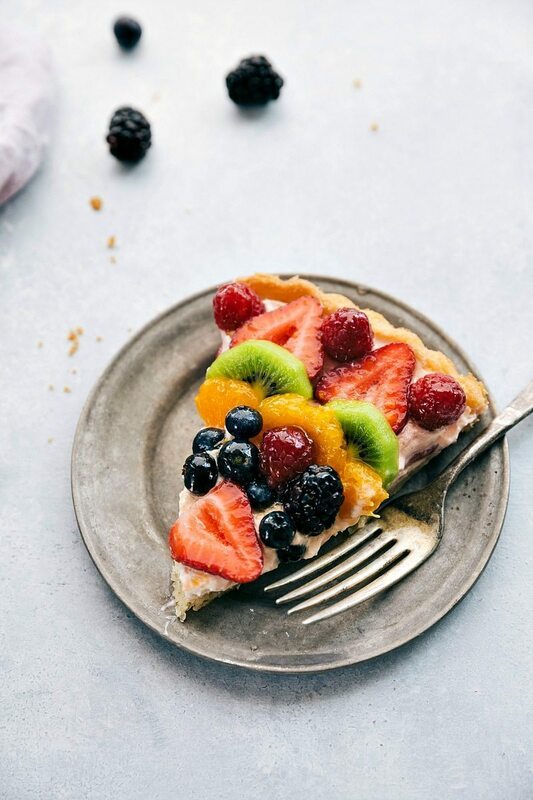 But THIS fruit pizza cheesecake tart (or so I’m calling it) is an original adaptation that I think is literally the most amazing form of a fruit pizza ever. I’ve talked about the filling quite a bit, so let’s dive into that for a minute. The filling has the flavors of cheesecake without the hassles of baking it. It’s also light and airy like a mousse. It starts with cream cheese + sour cream and then you’ll add quite a few flavorings — orange juice, almond extract, vanilla extract, and Orange jell-o mix (dry). You’ll add just a tiny bit of powdered sugar and once this mixture is all smooth and creamy, you’ll fold in some whipped topping. I recommend using frozen whipped topping that has been thawed as opposed to making your own whipped topping because it does hold up better in the tart and with the fruit. This filling gets whipped together in minutes and chills as the crust is baking and cooling. It’s got an insanely good flavor and the perfect texture to pair with a sugar cookie and fruit. And once you’ve got that filling thickly slathered all over the crust you get to decorate! 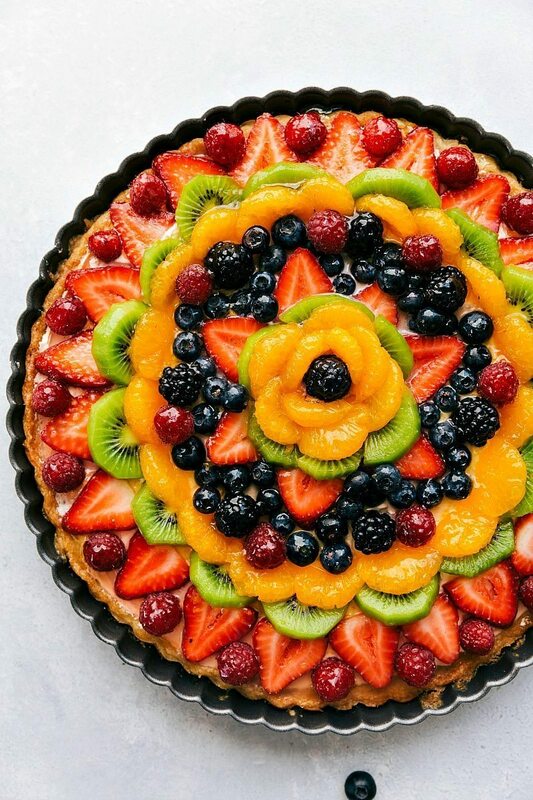 One of my favorite things about any kind of fruit pizza dessert is the creativity that comes in when decorating it — you can really do the top however you like and with whatever fruits are your favorite. I generally buy a whole bunch of fruit (let’s be honest, whatever is on sale that we like!) and arrange it different every single time! Preheat the oven according to package directions. Generously spray an 11-inch tart pan with nonstick spray and place the tart pan on a large sheet pan. Set aside. Unwrap the cookie dough and press it all evenly and up the sides (3/4ths the way up) on the tart pan. Bake in the oven for 18-22 minutes or until very lightly golden brown at the edges and center (be careful to not overbake). Remove and allow to cool completely. Make sure the cream cheese is softened and the whipped topping is completely thawed. Using hand mixers cream together the cream cheese, sour cream, orange juice, vanilla extract, almond extract, powdered sugar, and orange Jell-o mix. Beat until smooth and creamy. Gently fold in the whipped topping. Chill, covered, in the fridge until the crust is completely cooled. Arrange fruit however you would like across the top of this pie. Using a pastry brush, brush the mixture over the top of the fruit. Serve immediately or cool in the fridge (covered). Store in the fridge; best enjoyed the same day it is made. Previous Post: « Life Lately: Bentley is 6 Months Old! Fruits have natural sugar, so it must be good! 😛 LOL. I seriously cannot handle this cheesecake! Just look at all that pretty fruit! 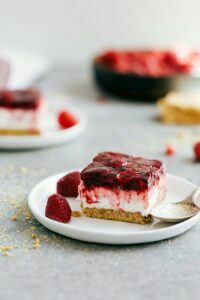 Plus the sugar cookie crust sounds like something I need to make asap! Gosh. I need it. 🙂 Love that you made this a fluffier cheesecake. I bet it goes so well with all the fruit! Almond extract in the crust is perfect. I love adding it to my sugar cookies. The whipped cheesecake filling sounds delightful. I love how light and airy it looks. What a wonderful welcome to Spring dessert. What a great spring dessert! Now if the weather would just cooperate here in NY so we can get it finally feeling like spring, we’d be good to go, haha! Love how you used a sugar cookie as the crust! Yum! Chelsea, this is so pretty!! I love your fruit design on top! 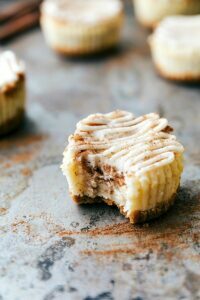 And the sugar cookie crust sounds so good – I love almond extract in sugar cookies, I think it makes them taste so good! Pinned!! Totally wish I could drop everything and make this right now. I really like that you focus on a wonderful, flavorful crust. Sometimes I don’t think people focus on the taste of the crust as much. There is this place in MN called Cafe Latte which has been featured on Rachael Ray…Anyways they have a cheesecake with an almond sugar cookie crust. It’s my favorite cheesecake I have ever had which I credit to the crust!! Totally pinning this one 🙂 LOVE it! I love every element of this cake! 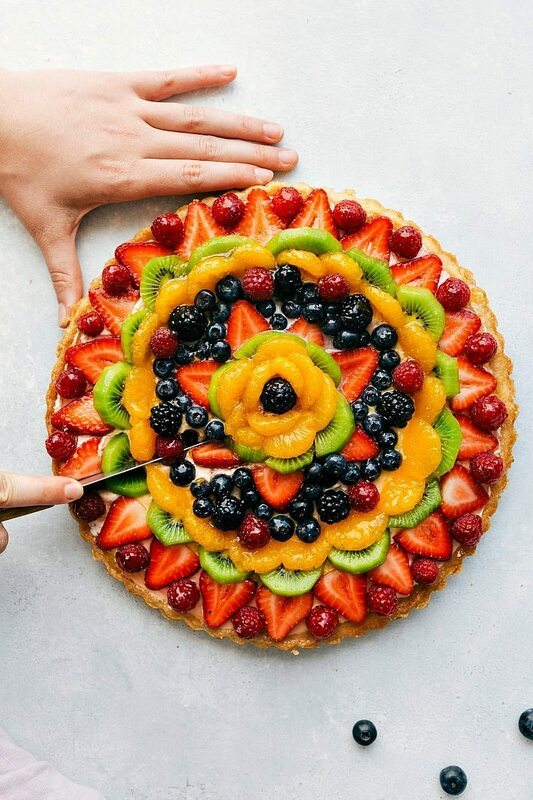 I can imagine biting into the fruit than the cheesecake layer and cookie crust, oh it’s so good Chelsea! Chelsea, so pretty! Pinning to try soon! I love a cookie with a little fruit! This is absolutely beautiful Chelsea! 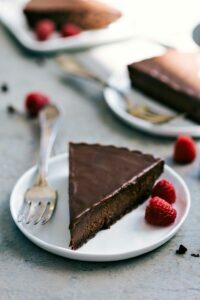 The most stunning cheesecake ever – Pinned! Such beautiful pictures! I want so of this right now. Thanks for sharing..pinned for later. WOW! This is amazing. And no we don’t mind at all that you shared it early! This is a beautiful dessert! So pretty, perfect for Easter! I LOVE desserts with lots of fresh fruit. Pinning now. My dad isn’t a fan of traditional (read: sweet sweet sweet) desserts like I am, so I’m always on the lookout for some great, lighter, and fruitier alternatives. Looks like this one fits the bill! So glad I stumbled across this on FG. Pinned! That is the prettiest cake/pie I’ve ever seen. And I bet it tastes even better than it looks! Love this! Reminds me alot of my rainbow fruit pizza but cheesecake style. 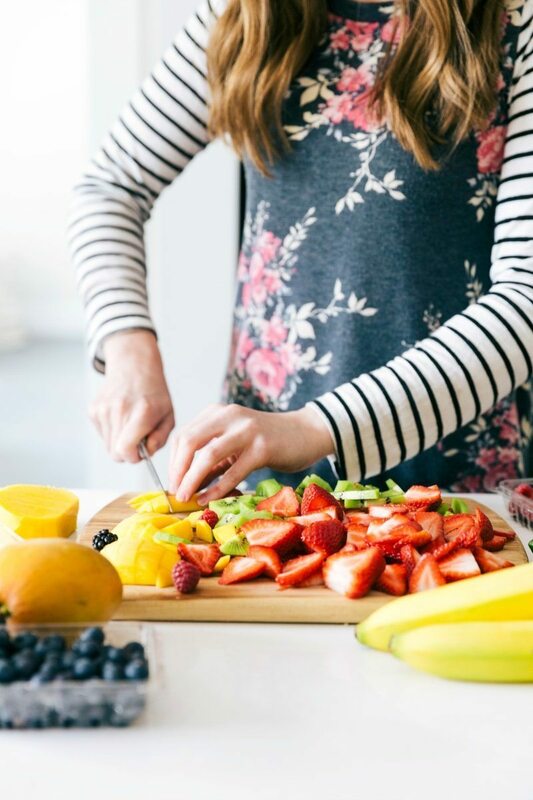 Totally where my inspiration came from – fruit pizza! Thanks Erin! What a beautiful dessert! Love all the pretty colors and the sugar cookie crust sounds so good! You are so sweet thank you Christin! I hope you’ve had a great weekend! 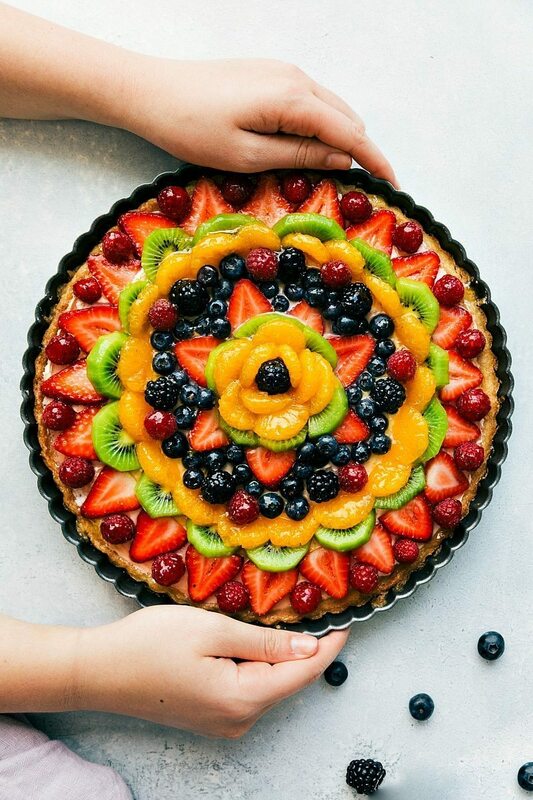 This pie looks like the first colors of spring and a delicious one at that. 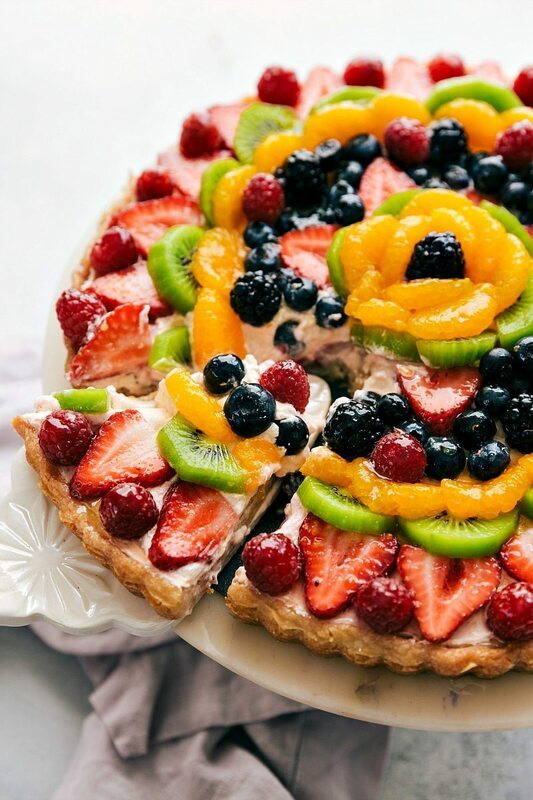 I love the addition of the sugar cookie crust and using so many fresh fruits. Thanks for sharing on Tuesday Talent Show. Gorgeous dessert! This beautiful cheesecake pie announces spring with a flourish! Yay for spring time! Thank you Wendy! This is gorgeous! I’m loving all of that bright fresh fruit. Since I’d be getting my daily fruit, I could indulge in like 3 pieces of this and not feel guilty, right?! 😉 Pinned! This is truly beautiful and I love that it has a homemade cookie crust, not one purchased in a tube 🙂 Would be a beautiful addition to a Spring brunch. Found you over at Two Cup Tuesday and am pinning this to share on Facebook fan page! Chelsea, so glad I found your blog! Your desserts look amazing going to try the fruit cheese pie for Easter! I made this for company and it was fabulous. It was creamy and light and delicious! I wanted to really boost up the flavor of strawberry since I was using California strawberries here in Canada. Ours will be coming in season in another 3 weeks. So I used strawberry greek yogurt and strawberry jello. It gave just the right flavor and I piled kiwis,cubed, in the middle of overlapping strawberry slices. Perfect! I also put it into a 6.5 ” springform pan so nice tall slices for the 4 of us. I really enjoyed the sugar cookie crust and will be making it more often. Maybe adding sliced almonds to it another time. Thanks so much for sharing this great recipe!